The feature below was added to my website on 27 November 2013, and was last updated in June 2018. Over the past thirty years, I must have made scores of journeys by road from South Wales to the Midlands and back. My favourite route has always been to follow the A438 from Brecon, crossing the River Wye at Glasbury, crossing the border into Herefordshire at Rhydspence and continuing through the villages of Whitney-on-Wye, Winforton, Willersley, Kinnersley, and Sarnesfield, eventually reaching Birmingham via Leominster, Bromyard and Worcester. 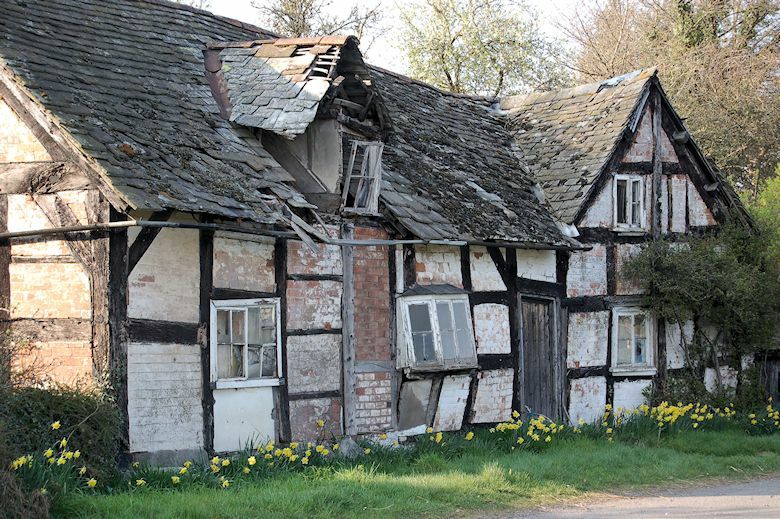 Every time I take this route I’ve been intrigued by the sight of a tumbledown old cottage on the roadside at Willersley, just before the junction between the A438 and the A4111. The dilapidated state of the building always drew my attention, but even more intriguing was that on several occasions, when driving past at dusk or in the evening, I had spotted through one of the windows a bare light bulb suspended from the ceiling. And the light bulb was switched on! How spooky was that! Surely no one could be living there? Back in March 1997, I stopped the car and took the two photographs shown below. The cottage appears to have been in a similar state of delapidation twelve years later, when I took the two photographs below. 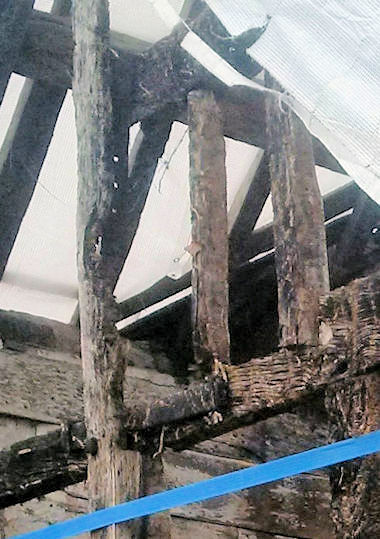 However, closer examination shows that the window frames had deteriorated over the intervening years, and some tiles had been lost from the dormer roof. As time passed by, the cottage became more and more ruinous and eventually a metal barrier was erected around the front of the building, presumably to protect any curious passers by. Above: The metal barrier erected along the front of the cottage. 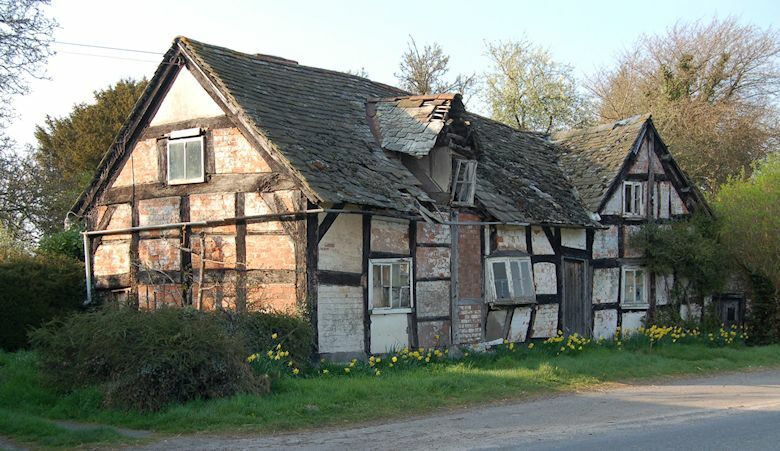 When I drove past the old cottage in October 2013 while en route to Hereford, I noticed a red car parked down the side of the cottage, suggesting it may still be inhabited. But I was shocked and saddened to see how much the cottage had deteriorated since my earlier visits. Two sections of brick wall and one of the front windows at the west end of the cottage had gone. The stone tiles around the dormer were disappearing fast, and the dormer itself seemed to be about to fall. Its window frame had gone. I pledged that before the cottage collapsed completely I would try to uncover some of its history. The first step was to identify the name of the cottage. A large scale Ordnance Survey map published in 1974 provided the answer.1 It named the cottage The Old Crow, located at grid reference: SO3134147426, a short distance away from Old Crow Farm. But why was it named The Old Crow? Had it once been a pub, perhaps? House. C17, altered mid-C19. 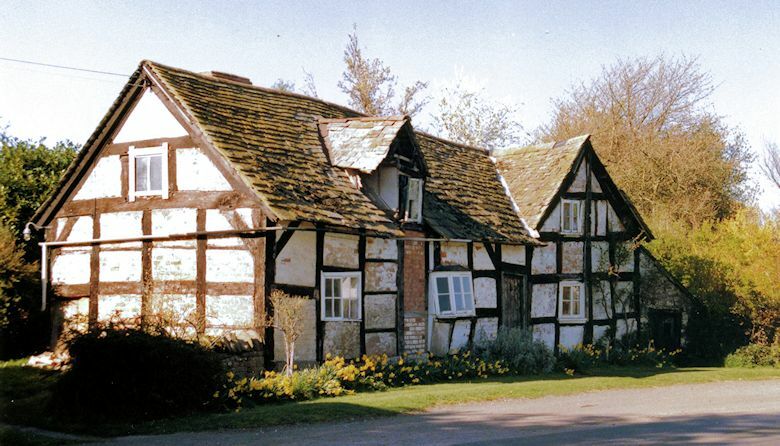 Timber-framed with painted brick infill on rubble base and stone-tiled roof laid in diminishing courses. T-plan; main range of two and a half framed bays aligned roughly north/south with rubble chimney and brick stack on west side. Cross-wing of two framed bays adjoins north end and has an external chimney at its west end. Single storey and attic. Framing: two and three panels from sill to wall-plate with short straight braces in some upper corners. 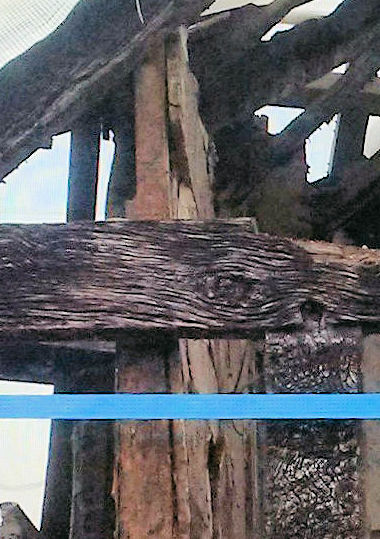 Collar and tie-beam trusses with struts. East front elevation: windows are C19 casements. Main range has a 2-light window and a small hipped-roofed oriel window on the ground floor and a gabled dormer with a 2-light window (one light blocked). Main entrance in half-bay adjoining cross-wing and has a C19 ledged and battened door. Cross-wing gable end has a 2-light ground floor and attic window. Attic lights at south gable end of main range. Lean-to outshut at north end. The description of the architectural features is interesting, but more relevant is the dating of the building to the seventeenth century. So The Old Crow had previously been known as the Queen's Head. Clearly the property was an inn or public house even before it was named The Old Crow. From the early 19th century until the first detailed census in 1841, we can trace the history of The Old Crow through references in local newspapers, particularly The Hereford Journal, searchable online on the British Newspaper Archive website.4 The narrative which follows is based solely on such references. 1 rood = 40 perches. In a newspaper item from 200 years ago (below left) The Crow Inn was described as an "old-established public house". Its occupant at the time was a Mr James Matthews, and the property included 66 acres 1 rood and 20 perches of "exceedingly good Arable, Meadow, and Pasture Land". It is likely that this 66 acres of land included part of the nearby Old Crow Farm, because two years later, in August 1815 (below right), the Hereford Journal gave notice of the sale by auction of The Old Crow Inn, Fold and Garden, containing 2 roods 5 perches, and the adjoining Crow Meadow (3 roods 5 perches) and Crow Pleck (1 acre 2 roods). This land area amounts to less than three acres of the 66 acres mentioned previously. The occupant is again identified as Mr Mathews [sic], whose tenancy appears to be soon to expire. Below: Auction notices in the Hereford Journal dated 23 June 1813 (left) and 30 August 1815 (right). Notice that in the 1815 sale, a Mr William Palmer of Pencoyd Court near Ross [on Wye] is one of the contacts for applications and further particulars. Could this be the same William Palmer who was named as the vendor in the Herrick Manuscripts when the property changed hands in 1843? Below: Auction notice in the Hereford Journal dated 2 June 1824. On this occasion, too, 67 acres of land are being sold as well as the Old Crow, and the property is occupied by a Mrs Elizabeth Davies. It is again unclear whether the inn or the farm or both are involved. 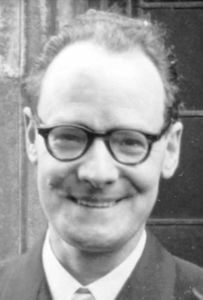 Applications and requests for particulars are to be sent to a Mr Walter Palmer of Pencoyd. Presumably he is a close relative of William Palmer referred to earlier. 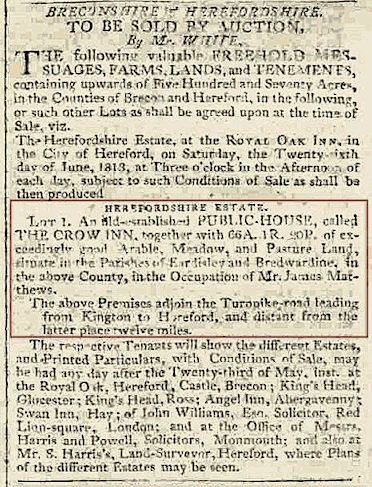 Four years later, in 1828, the Hereford Journal reported that the Old Crow (inn, farm or both), including 67 acres of land, was available for letting. Below: Letting notice in the Hereford Journal dated 23 January 1828. The present occupant is not named, but applications are to be sent to a Mr Palmer of Bollitree near Ross [on Wye]. Is this Walter Palmer or William Palmer? 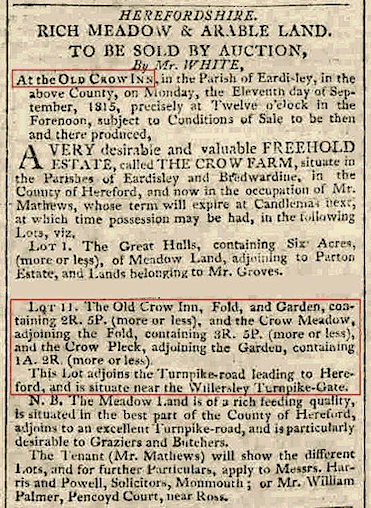 In 1831, The Old Crow public house, together with almost 67 acres of land, was advertised for sale by private contract. Below: Notice of sale in the Hereford Journal dated 17 August 1831. The Old Crow was occupied by a Mrs Alice Davies, who may or may not be related to Mrs Elizabeth Davies, the occupant back in 1824. 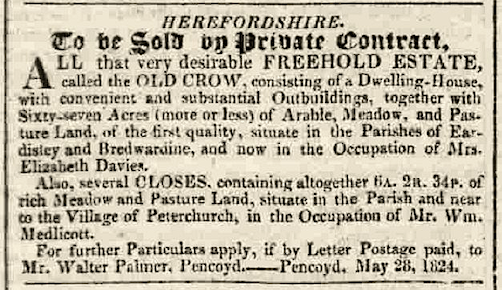 Below: Notice of sale in the Hereford Journal dated 5 May 1841. 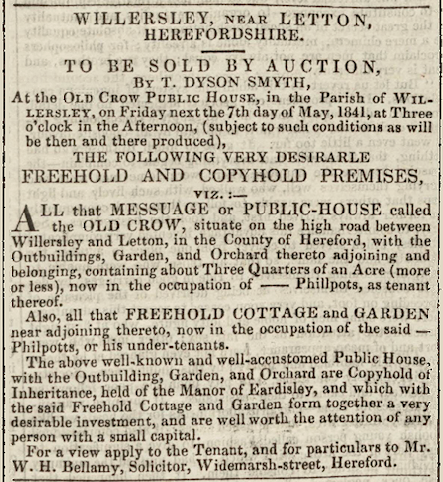 A decade later, in 1841, the Hereford Journal advertised the sale by auction of The Old Crow public house, complete with outbuildings, garden and orchard comprising about threequarters of an acre. The sale also includes (separately) a freehold cottage and garden, which seems to have adjoined the public house. It appears that the building we see now, in the 21st century, once comprised two residences: a public house and a cottage. According to the notice (right), The Old Crow was occupied by a "—— Phillpots", whom we can identify from the 1841 census taken the following month (see next section). It is possible to build up a picture of the occupancy of The Old Crow from 1841 onwards, decade by decade, using census returns. The following narrative is based largely on census data, but with occasional newspaper references where relevant. The census record shows that a Thomas Philpots [sic] and his family were resident in Willersley on the night of 30 June 1841. Thomas's occupation was "Inn Keeper", the only innkeeper in Willersley. Combined with information from the Hereford Journal a few weeks earlier the census confirms that Thomas Philpotts was landlord of The Old Crow Inn. Thomas was about 55 years old and his wife Catherine about ten years younger. Seven children (three sons and four daughters) are recorded on the census, with ages varying from 20 down to two years. Every member of the family is shown as being born in Herefordshire. The 1851 census records provide more detail than the previous census. Thomas Phillpots [sic] and his family are still there, but they have renamed their home the "Traveller's Rest". Thomas (now 66) describes himself as a "Horse Keeper" while his wife Catherine (55) is a "Cider Shop Keeper". It appears The Old Crow Inn has metamorphosed into a cider shop! Thomas and Catherine Phillpotts have only three of their children still at home: 18-year-old William, described as an invalid; 14-year-old Elizabeth, and Jane, aged 12. Just down the road, on the next page of the census, a John Powell, victualler, is running a previously unmentioned pub, named The New Crow! Subsequent censuses show no sign of the New Crow, so the business must have been a transitory one. 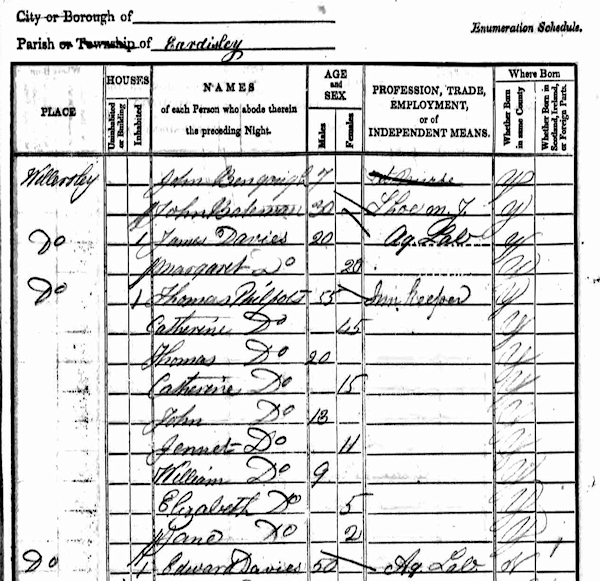 The 1861 census shows Thomas's 66-year-old widow Catherine Philpotts, "Public House Keeper", running the business. The property is not identified by name in this census. Catherine has four children living with her: William (26), described as a Horse Keeper, Elizabeth (23), Jane (22), and her married daughter Emma Williams (36). Catherine also has two young grandchildren living there. The same 1861 Census page shows another public house in Willersley, "The Wharf House", run by a 55-year-old widow Sarah Lloyd.10 Was this formerly known as The New Crow? Unlike the 1851 census, the 1861 census makes no mention of William Phillpotts being an invalid. 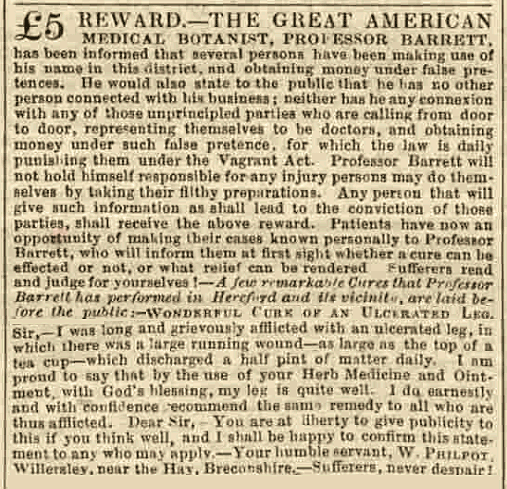 Perhaps the item (right) from The Hereford Times in August 1861 explains why!10 W. Philpot of Willersley [surely this is 'our' William Philpotts] writes a testimonial explaining why he wholeheartedly recommends Professor Barrett's remarkable herbal medicine and ointment, which apparently effected a cure of his chronically ulcerated leg. W. Philpot describes the ulcer as "a large running wound—as large as the top of a tea cup—which discharged a half pint of matter daily". The 1871 census shows the Phillpotts household headed by William, aged 37, single, and described as a "Beerhouse Keeper". His mother must have died in the ten years leading up to this census. William was accompanied by a housekeeper, his 15-year-old niece Lucy Phillpotts. The property is not identified by name in this census, suggesting that whether it was an inn or a cottage, it may no longer have been known as The Old Crow. The household enumerated next to William Philpotts was that of John Powell and his wife Sarah. This is the same John Powell who, twenty years earlier, had been running the New Crow. But in 1871 he describes himself as a butcher. There is no sign of The Wharf House in this census. The trail of The Old Crow Inn runs cold with the 1881 census. Old Crow Farm is identified (see above), but not the Old Crow Inn. Moreover, there appear to be no public houses, inns, beerhouses, or even cider shops in Willersley in 1881. One assumes The Old Crow was either being used solely as a residence or it was uninhabited. John Powell, butcher, and his wife Sarah are still present in Willersley, enumerated next to a Davies household headed by Alfred Davies, a "machinist" from London. It is possible they were the occupants of the Old Crow (cottage). But for the first time in at least forty years, there were no Phillpotts in Willersley. The 1891, 1901 and 1911 censuses fail to name The Old Crow Inn or Old Crow Cottage, so it is not possible to identify the property with any certainty in these censuses. Nor are any public houses identifiable. 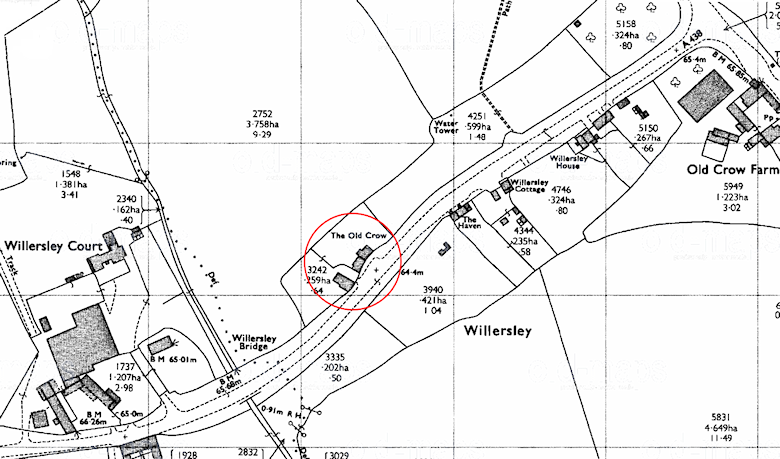 The 1901 census refers to Willersley Cottage, and the 1911 to The Cottage, Willersley. It is possible that this is the property previously known as The Old Crow. If so, its heads of household in these two censuses were: in 1901 Sarah Powell (widow of the butcher, John Powell); in 1911 Elizabeth Llewellyn (80-year-old widow). 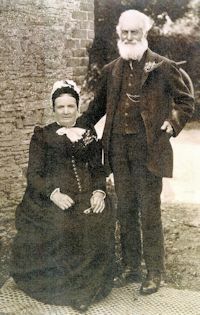 John Powell (butcher) and his wife Sarah were living in an unnamed property in Willersley in 1891. This may or may not be the property later identified as Willersley Cottage. 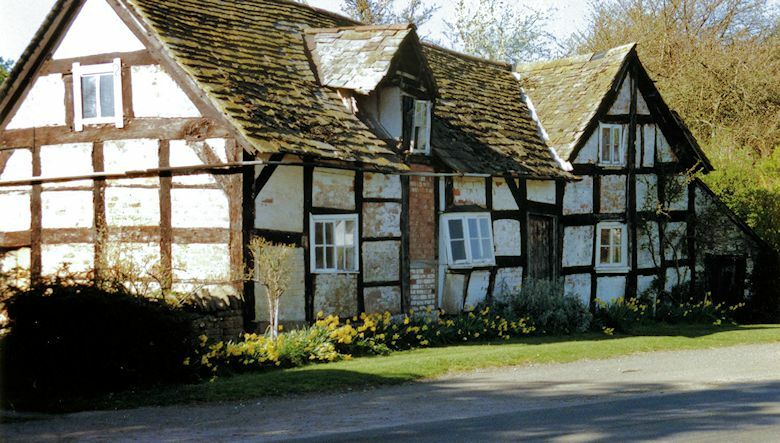 In 2009, a forum member reported that two brothers lived at the cottage, both well into their seventies.16 One lived in the cottage itself, the other in an old caravan in the orchard behind the property. Two years later, a member of another forum, intending to take some shots of the cottage, was confronted by a man described as quite smart, middle aged and wearing a jacket and tie.17 He said he was fed up with people nosing about and taking pictures of his home. He, or at least his car, was still there when I drove past the cottage in early October 2013. The identities of these occupants of the Old Crow remained a mystery until the end of November 2013 when I was contacted by a second cousin of the brothers who had lived there.19 The relative was prompted to contact me following her discovery of my Blog on the "Tumbledown Cottage", which I'd posted online in October 2013. Apparently, the three brothers were known locally as the "Penny Boys", Penny being their surname. They had all lived together at the Old Crow, none of them ever marrying. After the first brother (Philip) died, one of the surviving brothers (David) lived in the cottage, while the other (John) lived in a caravan in the orchard at the back of the cottage. A car and a lorry have been involved in a crash at Willersley. Emergency services, including an air ambulance, were called to the A438, near Crowe Farm, just after 2.55pm. One person ended up being trapped in their vehicle and is being treated by paramedics. The road, which is near the A4111 junction, has been closed by police. A man has died after his car was in collision with a lorry on the A438 at Willersley. Two ambulance crews, a BASICS emergency doctor from MARS (Mercia Accident Rescue Service), a paramedic area support officer and the Midlands Air Ambulance were all called just after 2.55pm. The driver of the car was freed from his vehicle and there were prolonged attempts to revive him. But he was confirmed dead at the scene by paramedics. The lorry driver was uninjured. The road is still reportedly closed. A 72-year-old man died in Herefordshire in a collision with a lorry driven by Bristol trucker. West Mercia Police are appealing for witnesses to the crash on the A438 at Willersley, at about 3pm on Tuesday. A red Citroen Saxo was in collision with a lorry. The Saxo driver, a 72-year-old local man, died at the scene. He has not yet been named. The lorry driver, a 54-year-old man from Bristol area, was not injured. The road was closed until just after 8.30pm to enable the vehicles to be removed, and investigation work to take place. PC Ian Crichard of West Mercia Police said: "As with all fatal and serious injury road traffic collisions, an inquiry is underway to establish exactly what happened. As part of that inquiry, we have spoken to a number of witnesses but would be keen to hear from anyone else who has not already given their details to police, including anyone who saw either vehicle prior to the collision." Anyone with information is asked to contact PC Crichard on the non-emergency number 101 quoting incident 295-s-221013. PENNY David Edward, of Willersley. Tragically died on Tuesday, October 22nd, 2013, aged 72 years. The Funeral will take place at St Mary Magdalene Church, Eardisley at 2 p.m., on Wednesday, November 6th, followed by Interment. The cremated remains of David's brothers Phillip and John will also be interred. Family flowers only, but donations, if desired, please, to the charity 'Cats Protection'. Funeral arrangements by Oak Tree Funeral Services of the Cemetery Chapel, Kington and 6 Castle Close, Eardisley. Tel: 01544 327829.
Who were the Penny Boys? The last remaining occupant of Old Crow Cottage was David Edward Penny, victim of the fatal accident described above. David had previously shared occupancy of Old Crow Cottage with his brothers Phillip and John. David was the gentleman described in 2011 by a photography forum member as "quite smart, middle aged and wearing a jacket and tie". In fact, rather than middle aged, he would have been about 70 in 2011. A search of the General Register Office (GRO) Births Index revealed the registration of the birth of a David E Penny in the Kington Registration District (volume 6a, page 1541) in the first quarter of 1941.24 Willersley is in Kington Registration District. If this is the birth entry of David Penny of Old Crow Cottage, the index shows his mother's maiden name was Jenkins. According to the GRO Marriage Index, a Thomas J. Penny married a Hannah Jenkins in the second quarter of 1927 in the Hay Registration District (volume 11b page 165).25 Hay, on the Herefordshire-Breconshire border, is only five miles from Willersley. Moreover, the 1911 census (see below) shows Thomas Joseph Penny then aged 16 to have been the son of Reuben Josephus Penny (of Winforton) and his wife Sarah Ann.26 In 1911 this Penny family was living at 'Woodseaves', Winforton (Woods Eaves is about 1½ miles northwest of Willersley). 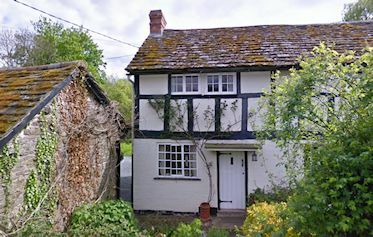 There is an entry for Reuben's marriage in the index to "England Marriages 1538-1973" on the FamilySearch.org website, according to which he married Sarah Ann Price at Rowlstone, Herefordshire on 31 August 1886.27 Rowl(e)stone is a parish and small village about 13 miles southwest of the City of Hereford. The 1911 census records another Penny family in the Winforton area: Reuben Penny's sister Susan Fanny and brother Arthur Edwin, both unmarried, are running the post office in Winforton.28 Living with them is their father Joseph Penny, aged 85, widower, born at Old Radnor. Earlier censuses confirm these relationships. In July 2014 I received a message from Jan Penney, a descendant of the Penny family of Winforton and a distant cousin of the "Penny boys". She sent me a photograph of two of the Penny Boys, plus several marvellous old photos of their great grandfather Joseph Penny, including two shots taken in 1899 on the occasion of Joseph's golden wedding anniversary. The portrait of Joseph (left) was taken in 1915 when he was 90 years old, while the photo of Joseph and his wife Ann (right) was taken in 1899. 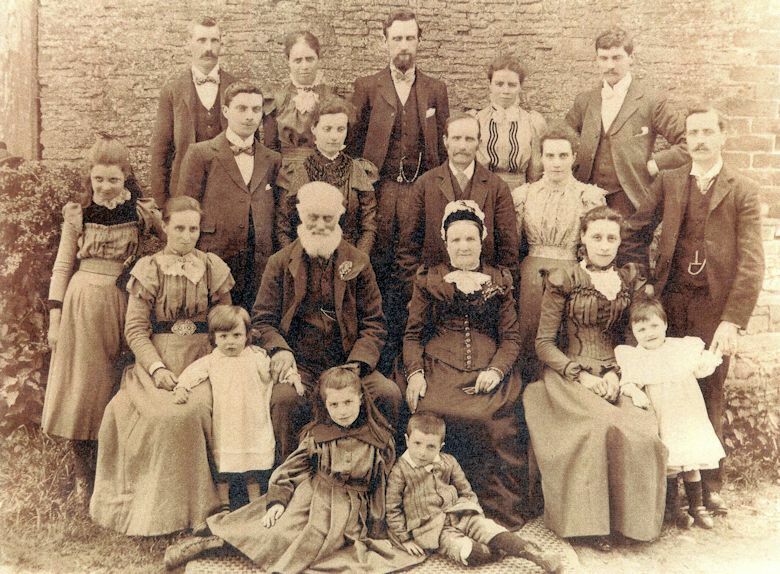 The family group below, also taken in 1899, shows their children and some of their spouses, plus four grandchildren. Most of these individuals are identified in the caption under the photograph. 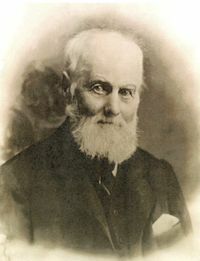 Joseph Penney had a younger brother Aaron (1825-1905) also born in Old Radnor. In 1867, Aaron (shown right) emigrated to New Zealand and was in the hospitality trade, owning several hotels over his lifetime in Blenheim, Marlborough, New Zealand. Interestingly, there were two Penny families in Blenheim in the early days; the Bookshop Penny's and the hotel Penney's, neither of which were related. It is thought that Aaron may have added the extra E permanently to distinguish his family from the bookshop family. Left: Winforton post office building still exists (Grid Reference SO 29792 46969) and is Grade II listed,34 but it is no longer a post office. It has been renamed Penny's, probably in tribute to and memory of its former occupants. Joseph's grandson Thomas Joseph Penny, father of the Penny Boys, died aged 88 in 1983.36 His death record gives his birthdate as 9 May 1894, which is consistent with his age (16) recorded on the 1911 census. These are most promising discoveries. We have been able to identify not only the father of the "Penny Boys" of Old Crow Cottage (Thomas Joseph Penny), but also their paternal grandfather (Reuben Penny), their great grandfather (Joseph Penny) and his brother Aaron who went to New Zealand. Since undertaking this research into the Penny family, at the back of my mind has been the realisation that my own BALL family had a link with a member of a PENN[E]Y family: surely there couldn't be any connection between my family and those who inhabited the Old Crow! In 1953 my father's sister Alice Victoria BALL, then a fifty-three year old spinster, married one Frank Leslie PENNEY (shown right), widower, born in Birmingham in 1899, whom my brother and I knew as "Uncle Frank". I'd never properly researched Uncle Frank's ancestry, and the thought had never entered my head that there might be a connection with the PENN[E]Y family of Radnorshire and Herefordshire. But I was wrong! In 2015, I decided to investigate Uncle Frank's ancestry and it soon became clear that Frank Leslie PENNEY was indeed a descendant of the same line as the Penny Boys of the Old Crow! 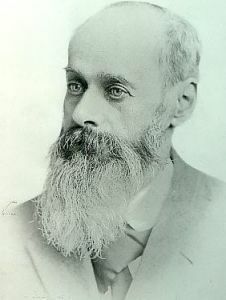 Frank Leslie PENNY (b. 1899, Birmingham) was the son of Joseph William PENNY (b. 1865, Handsworth, Staffs), the grandson of Emmanuel PENNY (b. 1837, Kington, Herefordshire), and the great grandson of Joseph PENNY (b. 1796, Stanner. Herefordshire). Furthermore, Emmanuel PENNY was a younger brother of the Joseph PENNY (b. 1825), long-serving subpostmaster at Winforton, from whom the Penny Boys were descended. Uncle Frank's great grandfather was the Penny Boys' great great grandfather! Of course I am not a blood relative of the Penn(e)y family – but this new-found connection between me and The Old Crow is truly an amazing coincidence. I have done a lot of family history research over the years and when I was researching the Penny/Penney family in the 1980s, I visited the area a couple of times and called at the Old Crow while Phillip and John were living there. David was living in Hereford at the time and I never met him. Phillip and John didn't let me into the cottage but brought out a couple of framed photos for me to see. One was a large portrait of my great-grandfather Joseph, with a big white beard. They kindly sent me a copy of it later. At the time, one brother lived in the cottage and the other in the caravan. I've been looking through my Penny file and noticed that Alfred Abel Penny was at the Old Crow when he died in June 1922. He was Reuben's brother-in-law and first cousin - his mother was Martha, one of Joseph's sisters, and he married his cousin, Agnes Ann Penny. 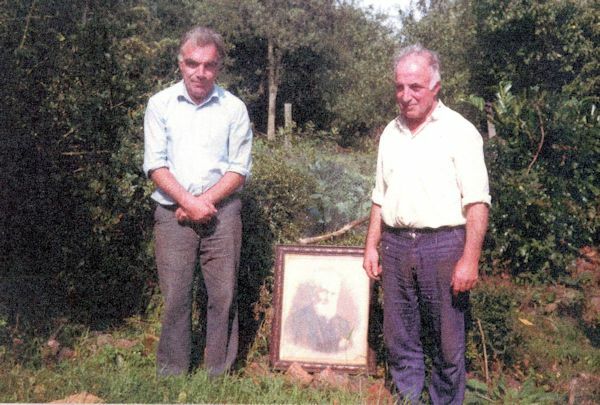 Jan Penney took the photo (below) of John and Phillip Penny when she visited in the 1980s. Between them is the framed old photograph of their great grandfather Joseph Penny. Working for the Royal Mail I used to deliver mail to [the Old Crow] on the Winforton delivery, after taking the mail from Hereford to Kington sorting office first thing in the morning. I always wondered that if I had to knock the front door the roof would collapse! 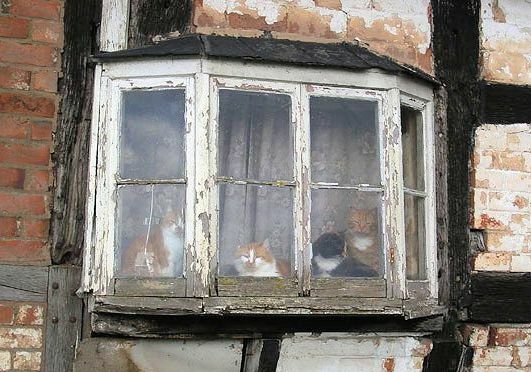 I also remember the cats sunning themselves in the front window [see below]. I would pass Mr Penny on his bicycle, immaculately turned out with cycle clips pedalling towards Eardisley, where he would visit the Strand for a drink and watch the horse racing. He even had battery lights on his bike and must have cycled back home sometimes in the dark. His death was very tragic for someone still active for his age. When delivering his mail I would pull across the main road to outside his cottage and then return to the opposite side of the road. This was always a tricky manoeuvre, as the cottage was on a blind bend with fast traffic travelling towards the road junction with the A4111. When David Penny died in October 2013, he willed his home to a friend. In July 2014, the new owner put the property on the market, to be sold by public auction on 11 September 2014 by McCartneys of Hay-on-Wye. For further details, see the website of RightMove.co.uk. Let us hope that whoever purchases the cottage will have the resources and the imagination and sensitivity to restore it sympathetically for us all to enjoy for many years to come. A large crowd gathered at the New Strand Inn, Eardisley, last Thursday evening (11 Sep) for the auction of The Old Crow. 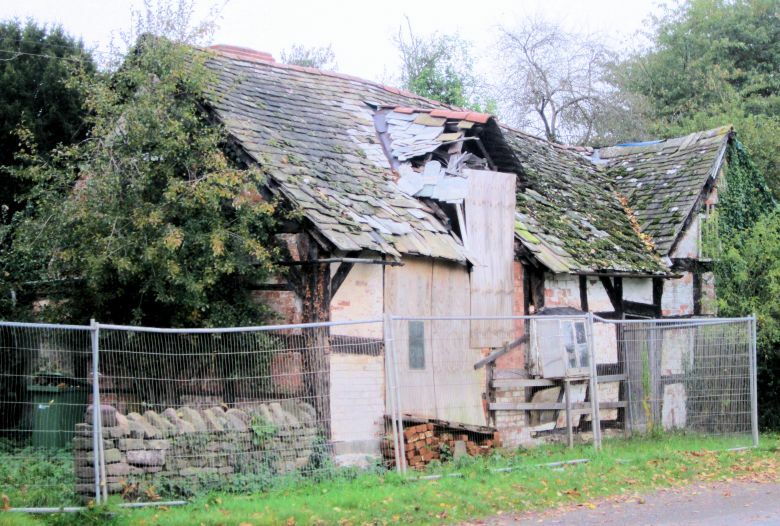 The property was eventually sold (for £160,000) to a local developer who intends to restore the cottage. I look forward to seeing work begin on The Old Crow in the coming weeks and months, and hope to provide photographic evidence of the restoration as it progresses. I visited The Old Crow yesterday (22 October) on the first anniversary of the death of David Penney, its last occupant. I was hoping to see that work had begun on the restoration of the cottage. I was disappointed. As my photograph below illustrates, there is no evidence of any recent activity on the site and the old building continues to decay. I visited The Old Crow again on 30 December. My photographs below show little evidence of any restoration work, but the land around the cottage seemed to have received some attention: it certainly looked tidier than on my last visit. I will continue to make regular visits to The Old Crow and report any developments. On 7th March I received news about The Old Crow from Carol Close. 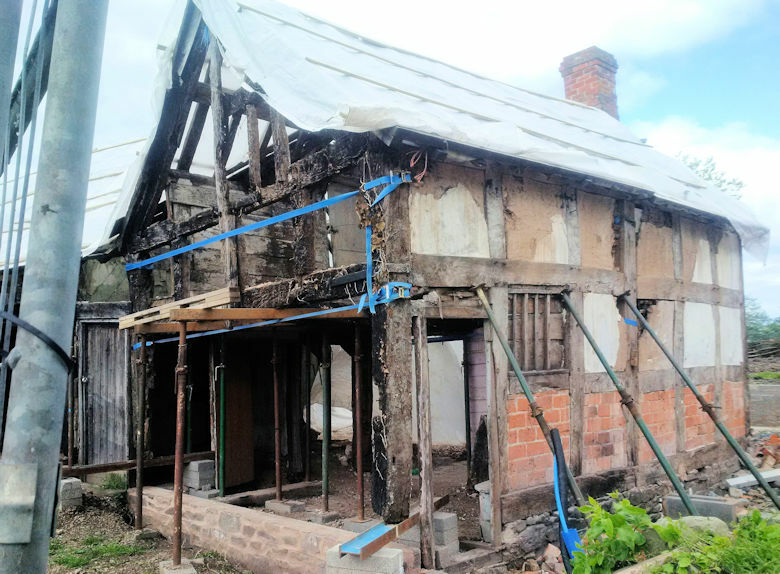 Carol, who regularly travels between Brecon and Bewdley, reported that work started on the cottage in the past month or so. Three days later she took some photos of the current state of the cottage, one of which I have reproduced below. Her photo clearly shows that work has begun on the roof. Other photos show that some of the vegetation has been cleared from the land around the cottage and excavations are in progress, possibly for drainage and the construction of footings for an extension behind the cottage. 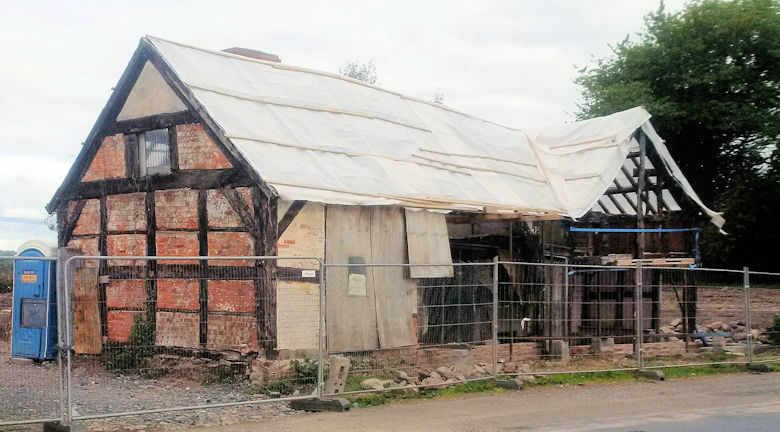 When I drove past the Old Crow en route to Hereford in early June it appeared that all the roof tiles had been removed, at least on that part of the roof visible from the road. 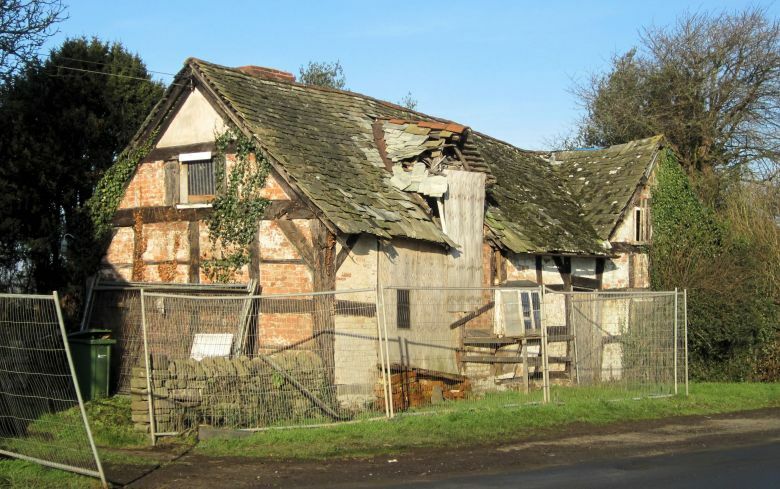 Today I discovered that a planning application relating to restoration of the Old Crow was submitted to Herefordshire Planning Department two months ago and is currently in its consultation phase. The deadline for receipt of comments and objections is next Tuesday (7th July 2015). The planning application can be accessed via Herefordshire Council's Planning Application Search webpage. There are actually five applications available (numbers 151398, 151399, 151400, 151401, and 151402) each one relating to a different aspect of the development of the land and its buildings. Application 151402 relates to the cottage itself. Planning proposals include architect's drawings of the existing cottage and the proposed restoration/conversion as well as various site plans. Also available are copies of objections and comments received from interested parties. 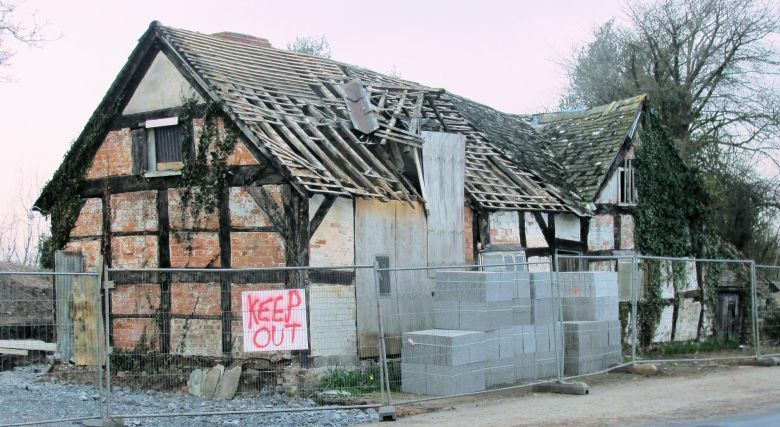 In particular a conservation consultant (on behalf of Herefordshire Council) and the Ancient Monuments Society, express concern about the lack of detail provided by the developer in support of the application. I strongly urge you to study these (PDF format) documents for yourselves by following the link given above and entering 151401 in the search box. I currently pass this building a couple of times a week and I can now confirm that it's undergoing extensive renovation with significant building work taking place. 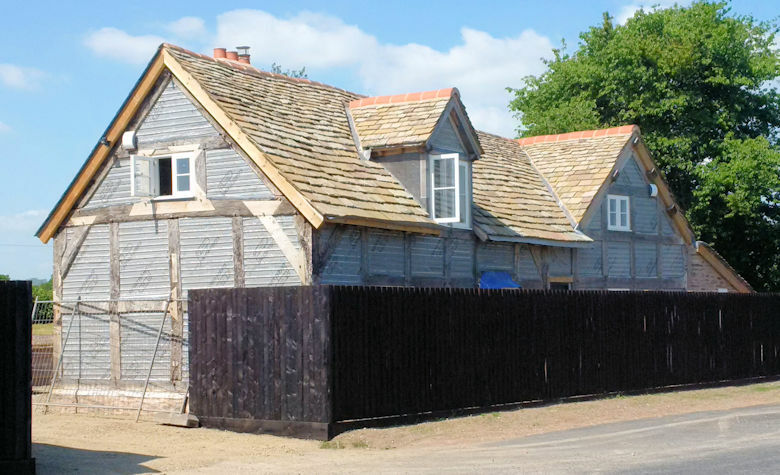 You can now see in to some of the house due to walls being removed for rebuilding, and the large outbuilding next to it is also being renovated. We are underpinning the whole house as it was very unstable. 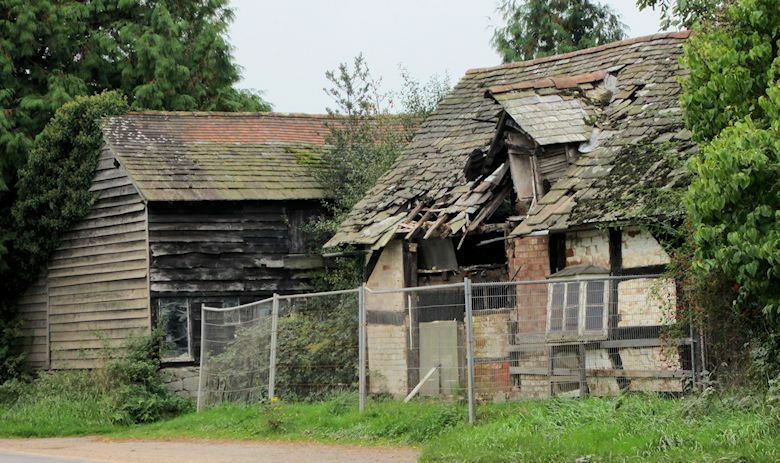 A specialist contractor is removing, copying and replacing all rotten timbers. We have saved and cleaned all original roof tiles ready for retiling. We are retaining all the old features such as the oven. Mr Prosser says he is determined to restore the cottage to its former glory. He aims to complete the project for summer 2017, says it is a long process that needs to be done with care. The present state of the project is illustrated in the following photographs, taken by John Ball on 23 May 2016. Above: The Old Crow – general view. Compare this with the 1997 photograph at the top of the webpage. Although not shown in the photographs, work is also progressing at the adjacent barn, a few metres west of the cottage. The building is now partly hidden from the roadway by a wooden fence. The property has been re-roofed using the original tiles. The walls have been restored and appear to be awaiting application of the final finish. 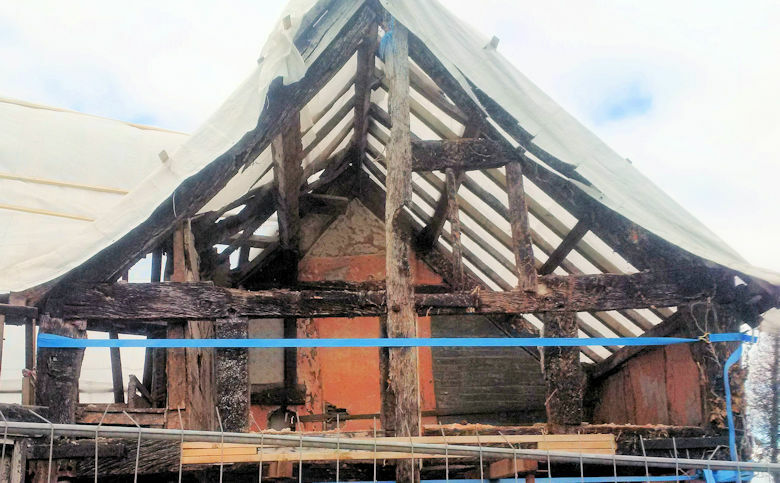 The present state of the project is illustrated in the photograph below, taken by John Ball on 22 May 2018. Above: The Old Crow – general view. Work appears to have been completed on the adjacent barn, a few metres west of the cottage (not shown in photograph). To Deborah Taylor-Lang, for providing the vital connection between the Penny Boys and the Old Crow. To Joy Parker of New Zealand, for clarifying the identity of the Penny brothers, and providing a physical description of them. To Jan Penney, for providing extra details and allowing me to use her superb old photos of the Penny family. To Jenny Pierson (née Penney) of New Zealand, for correcting the date of a photo of Joseph Penny, and allowing me to use her wonderful old photo of Joseph's brother Aaron Penny. To Tracy Beaumont and Marjorie Beaumont (a first cousin of the Penny Boys), for identifying Reuben's daughter Frances in the group photo taken in 1899. To Martin Gilleland, for sharing his memories of the Old Crow and for offering the photo of cats in the cottage window. McCartneys, estate agents of Hay-on-Wye, who informed me in August 2014 of the impending sale of the Old Crow and who provided me with details of the outcome of the auction. To Carol Close for providing an update on and photographs of restoration work on the Old Crow in March 2015. To James Ewins for providing an update on restoration work on the Old Crow in April 2016. To Andy Prosser, current owner of the Old Crow, for sending me a detailed progress report in May 2016. Ordnance Survey: 1:2500-scale map published 1974/75, viewed on Old-Maps website (accessed October 2013). Please write via my Contact Page with your comments about the feature above.